In magnetic resonance imaging, RF modelling is a necessary approach used in the design analysis of MRI RF systems. This talk shares insights into technical details of implementing the most popular numerical electromagnetic (EM) methods. In particular, hybrid full-wave EM methods and parallel computing are highlighted, which creates a powerful theoretical prototyping platform for the design of novel RF coil systems for advanced MRI applications. 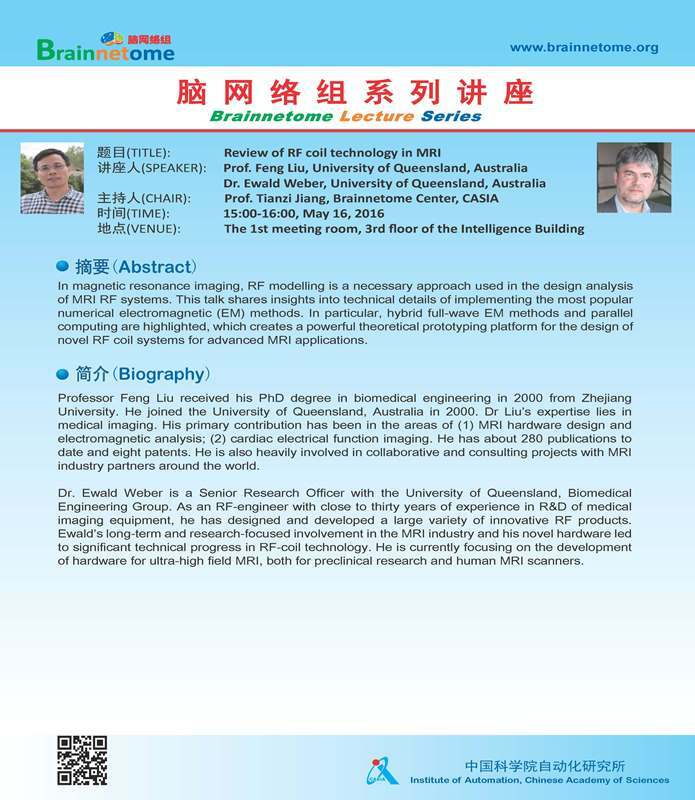 Professor Feng Liu received his PhD degree in biomedical engineering in 2000 from Zhejiang University. He joined the University of Queensland, Australia in 2000. Dr Liu's expertise lies in medical imaging. His primary contribution has been in the areas of (1) MRI hardware design and electromagnetic analysis; (2) cardiac electrical function imaging. He has about 280 publications to date and eight patents. He is also heavily involved in collaborative and consulting projects with MRI industry partners around the world. Ewald Weber is a Senior Research Officer with the University of Queensland, Biomedical Engineering Group. As an RF-engineer with close to thirty years of experience in R&D of medical imaging equipment, he has designed and developed a large variety of innovative RF products. Ewald's long-term and research-focused involvement in the MRI industry and his novel hardware led to significant technical progress in RF-coil technology. He is currently focusing on the development of hardware for ultra-high field MRI, both for preclinical research and human MRI scanners.